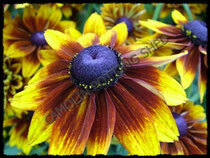 This is a new variety of Rudbeckia which is flowering well for us at the moment. We first saw this at Plantarium in Holland a couple of years ago and now we have finally got our hands on a few. It is one of the City series, the others being Dublin and Peking. This plant is an interesting cross between Rudbeckia and Echinacea and was done by Brian Kabbes from Holland. It flowers for a full two months from July onwards.